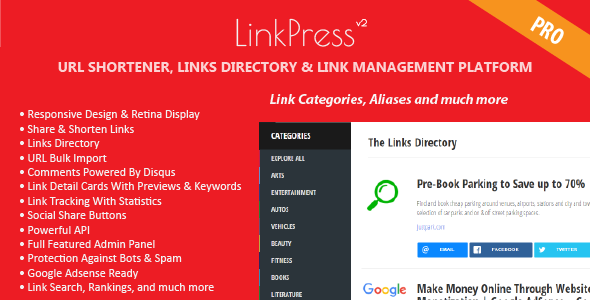 LinkPress is a URL shortener, links directory andlink management platforms script built with PHP, MySQL, Laravel and Bootstrap. LinkPress allows easy sharing and shortening of links. Revenue can be earned through placement of ads on the redirection spots. Get ready to get the most out of your social and online marketing efforts. Own, understand and activate your best audience through the power of the link with LinkPress.